Deep in the humid, hot and dense woods that make up the 25th Infantry Division’s Jungle Operations Training Center (JOTC), in Hawaii, a class dismounts from vehicles to conduct squad level missions as part of their culmination exercise. This training mission, will be led by Colour Sergeant Gaz McMahon and Colour Sergeant Som, instructors from the British Jungle School in Brunei. The experienced soldiers have been invited to be guest instructors to share best practices and concepts for operations in the jungle with the US squad. The Jungle Skills Course gives the students an increased appreciation and respect for an environment that is very different than the desert and mountains in which the Army has found itself operating in over the past decade-and-a-half. 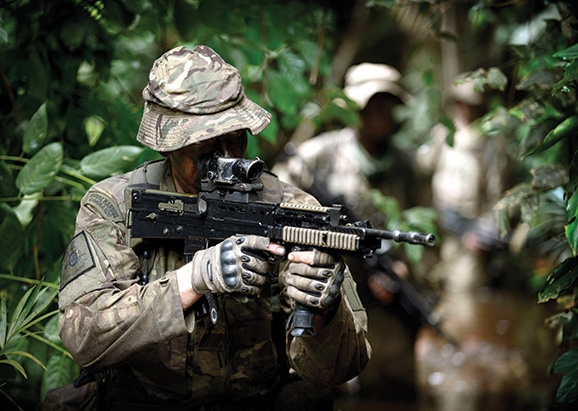 The exercise allows both armies to share their detailed knowledge of jungle soldiering skills. During the three-week course, both guest instructors witnessed how quickly students are expected to move and execute mission objectives after learning new skills, not just as individuals, but also as a team. The biggest difference between the school in Brunei and Lightning Academy is the rank of students going through according to McMahon. It starts with Corporals-U.S. Army E-6 equivalent-up to Captain and it’s an eight-week course, which allows more time to focus on specific skills from a big picture point-of-view. Just like their guest instructors, 25th ID instructors have collectively been to a number of jungle courses around the world, including Japan, Australia and Africa. This helps create a broad and encompassing curriculum to challenge and instil good habits into the students, such as tracking, equipment recovery and hunting. CSgt’s McMahon and Som look forward to inviting JOTC instructors to Brunei to guest instruct, sharing knowledge and skills to the British students, further strengthening partnerships and capabilities between both nations.